We visited the Alcazar in Córdoba. 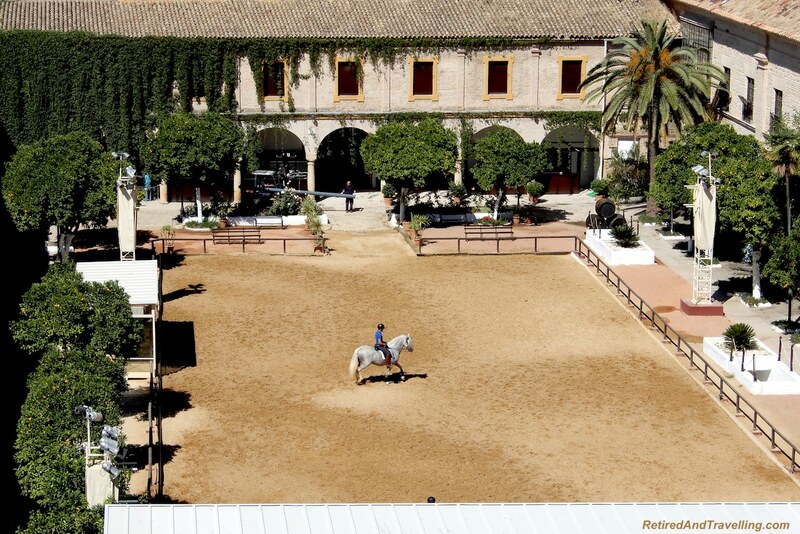 When we climbed high in the Lion Tower, we could see the Equestrian Centre. Horses and riders practiced in the open-aired arena. 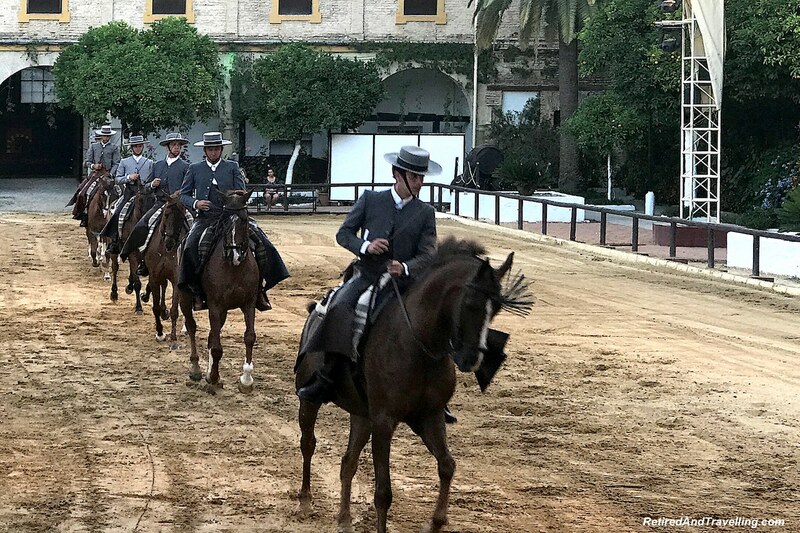 When we left the Alcazar, there was a horse and costumed rider with brochures about the Andalusian Horse Show in Córdoba. 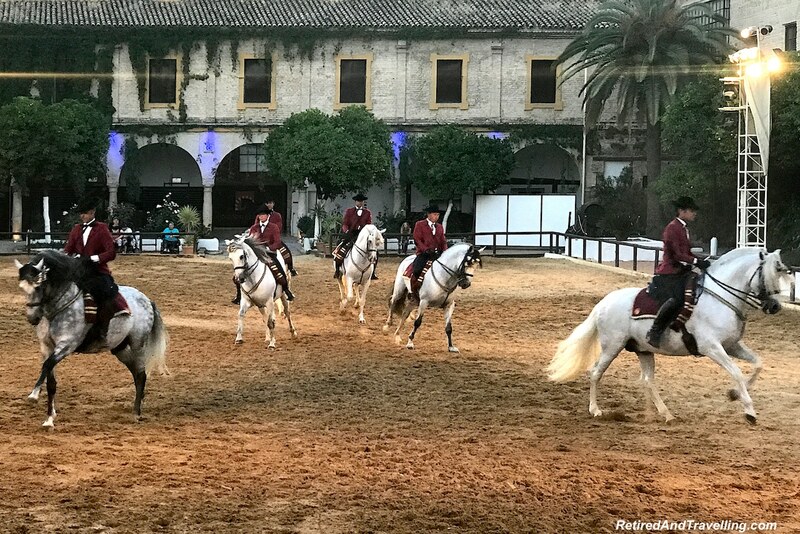 The Andalusian horse show in Córdoba (Caballerizas Reales de Córdoba) would be our evening treat to experience another Andalusian tradition. 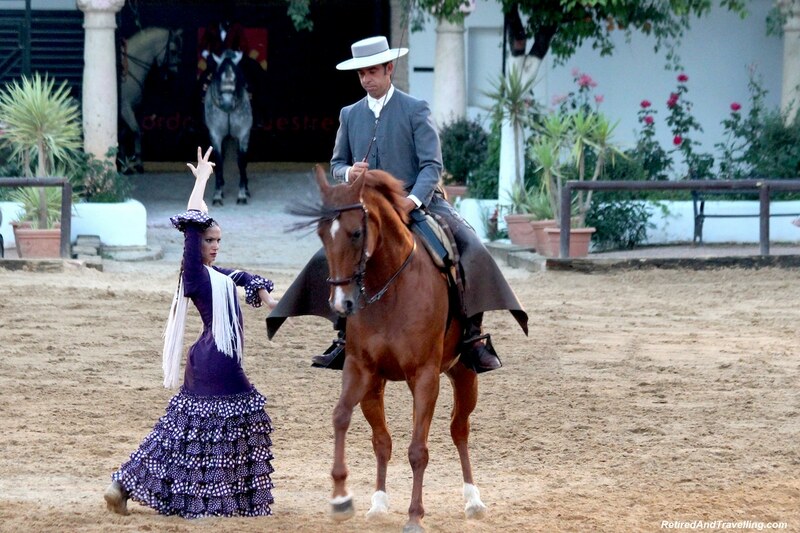 We enjoyed our Andalusian food and flamenco tour in Seville. 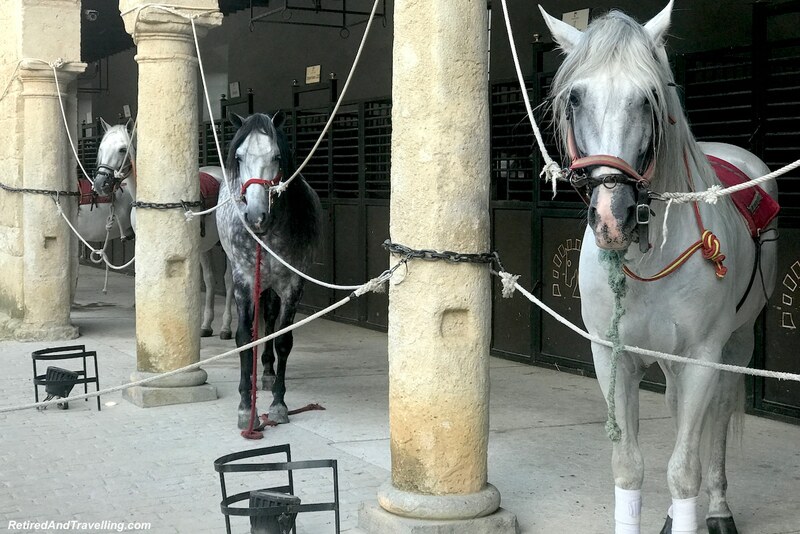 And we did a typical Andalusian hammam experience in Córdoba. The only thing we missed was a bull fight! 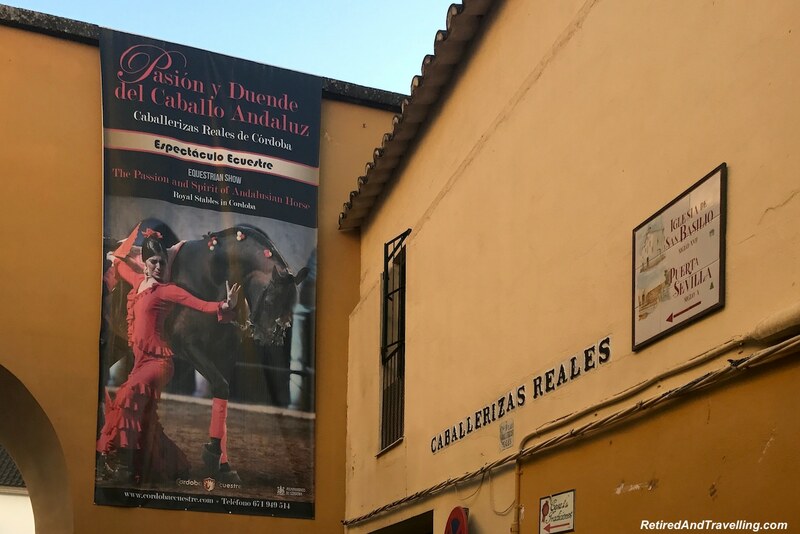 We purchased premium tickets for the Andalusian Horse Show in Córdoba. This gave us seats in the centre and early admission to the venue. 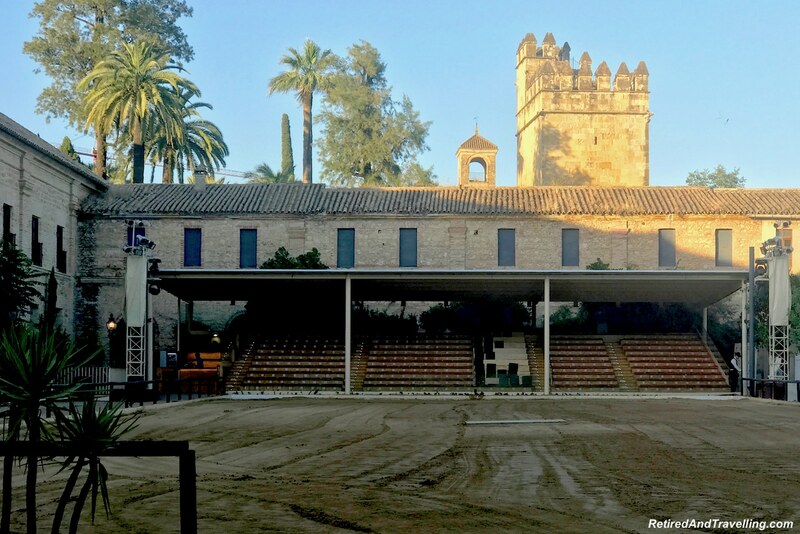 As we entered we could see the arena with seating at one end with the Alcazar towers in behind. It was still over 36℃ (97℉) at 9pm. The stands had cooling jets aimed down at the seats. This kept us pretty cool through the show however there was a cloud of mist in many of our pictures! The stalls were around the outside and most contained show horses. 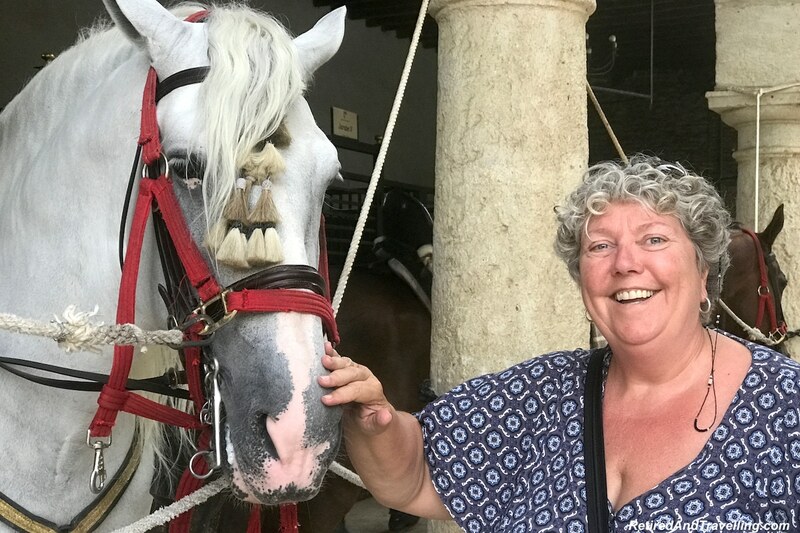 We walked from horse to horse looking at the various kinds of horses. The decorations varied by routine in the show. Despite the crowd of people walking around, the horses seemed calm. Only the flies seemed to make them jumpy. 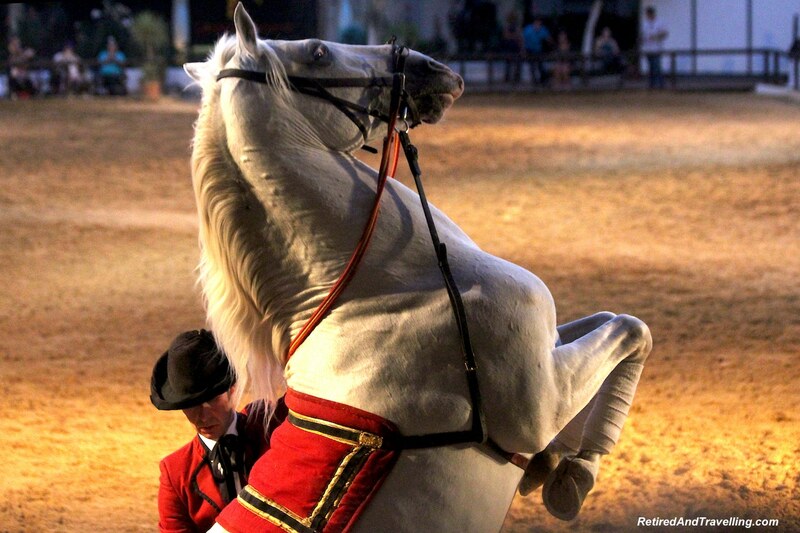 There were several different types of routines performed at the Andalusian Horse Show in Córdoba. We saw several displays of horses moving with precision. Several times we saw large groups of riders moving in formation around the arena. The most interesting part of the parade routine was when the horses walked sideways. 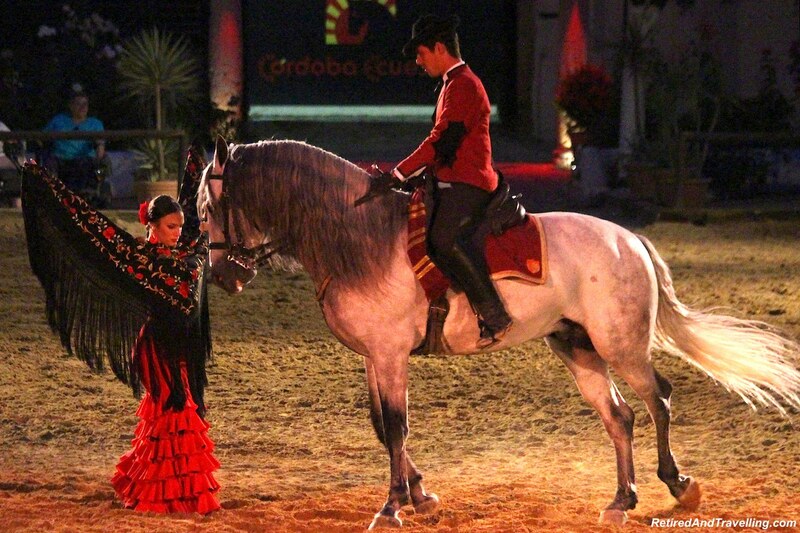 There were several routines where a female flamenco dancer performed with a horse and rider. 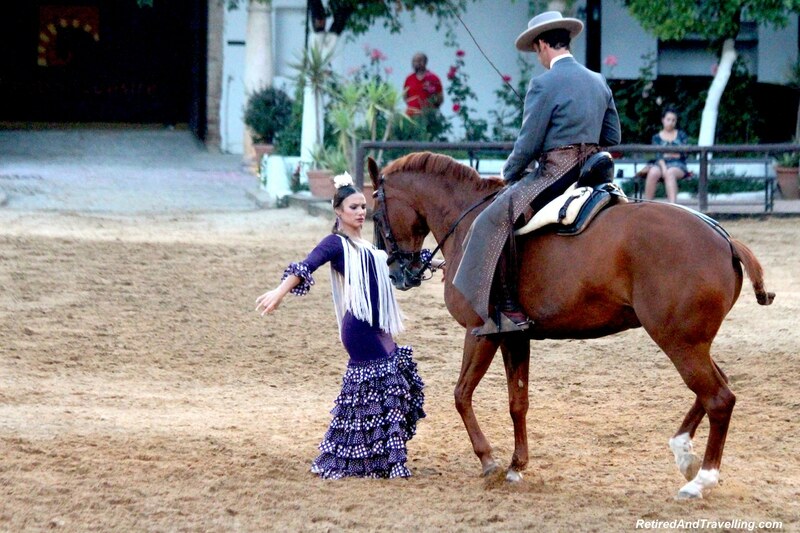 The horse seemed to move in rhythm with the dancer as she moved around the arena. 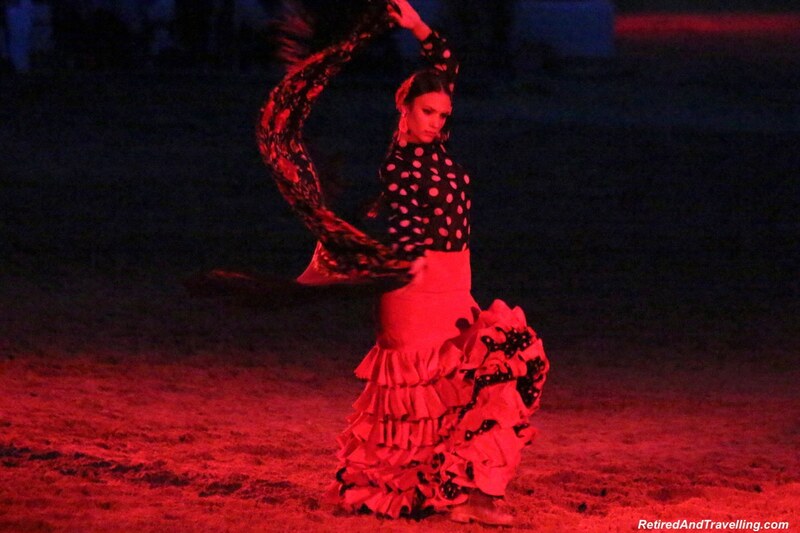 It reminded us very much of the food and flamenco tour we did in Seville. 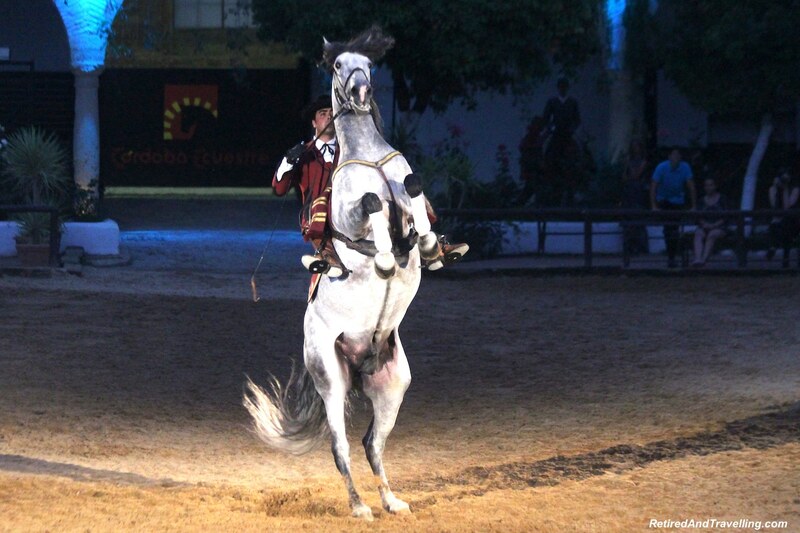 At the end, the horses were brought in to perform tricks. 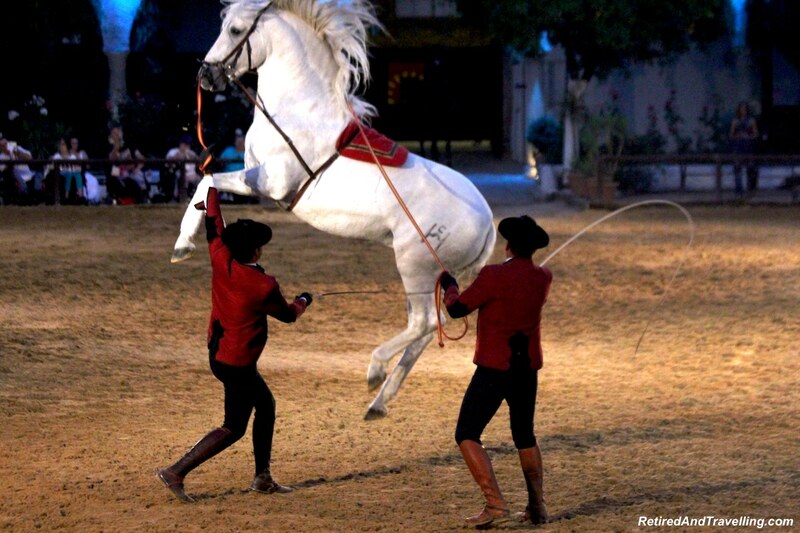 Under the control of tightly held reins and snapping crops, the horses were made to walk in rhythm, do a high kick or stand on the rear legs. As much as the moves were interesting, I was a bit unsettled knowing what it took to get the horses to perform these moves. 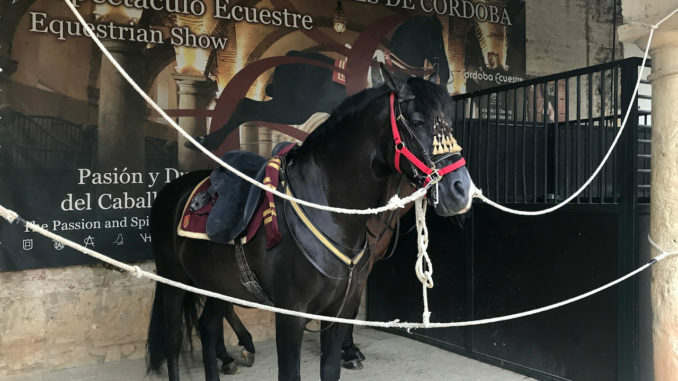 We went to the horse show in Córdoba to add to our Andalusian experiences we were having on this trip. The tickets were not overly expensive at 20€ for premium seating and the show provided a good number of varied performances. 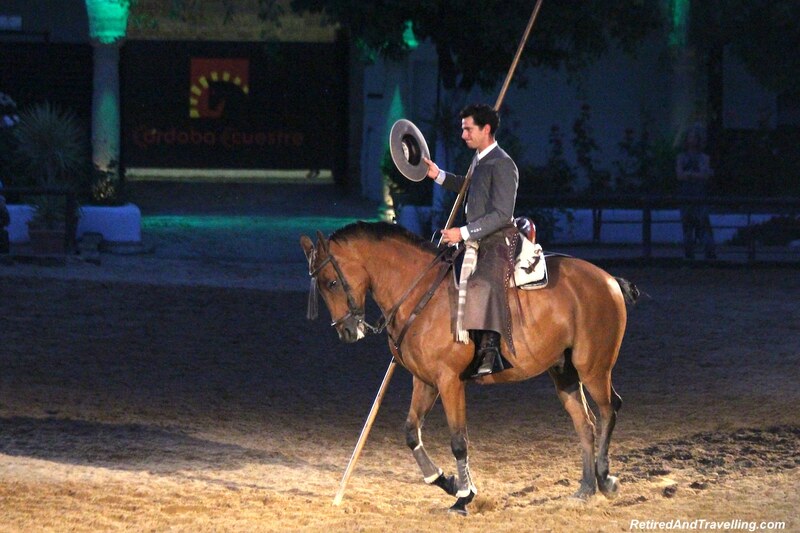 Having seen a lot of precision horse riding, I found the quality of the rider’s skill varied. 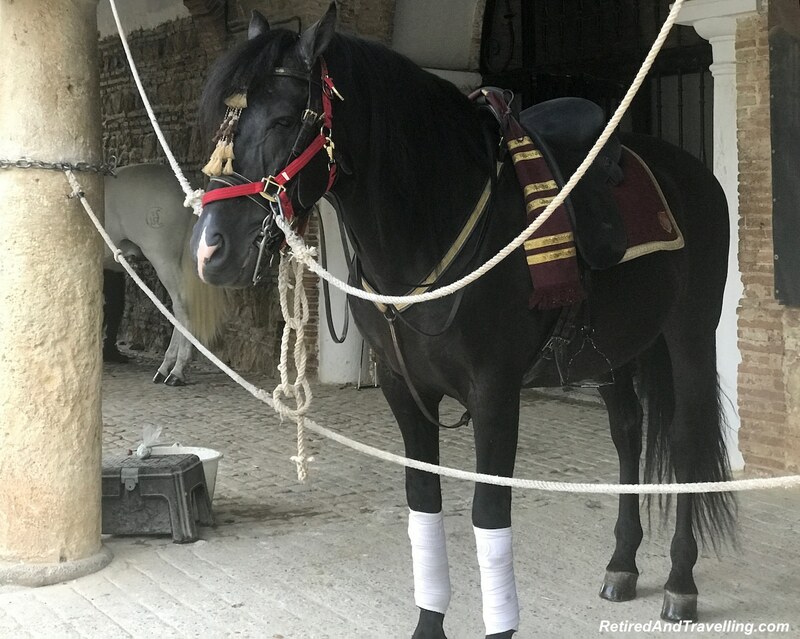 Some had perfect control of their horses and others seemed far less practiced or experienced. 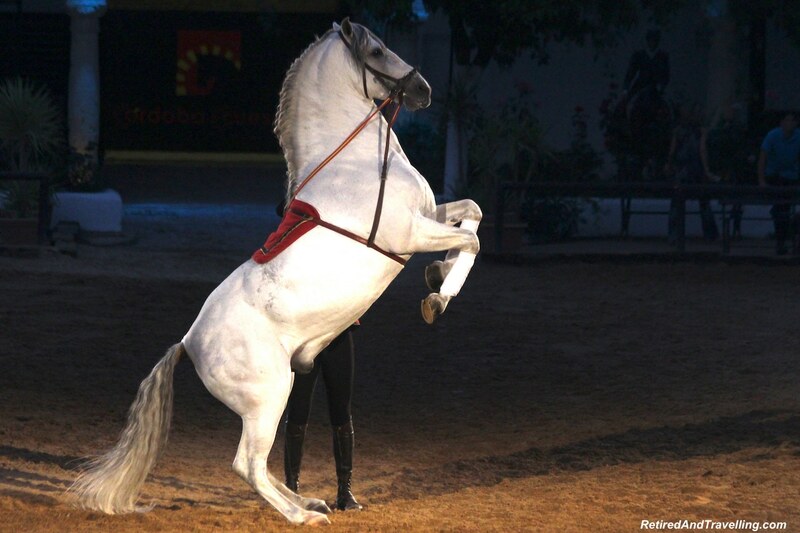 I had a mixed reaction to the horse tricks. Seeing these large animals doing complicated tricks was fascinating but I was a little unsettled. Our next Andalusian experience on our visit to Cordoba was a hammam spa bath treat. 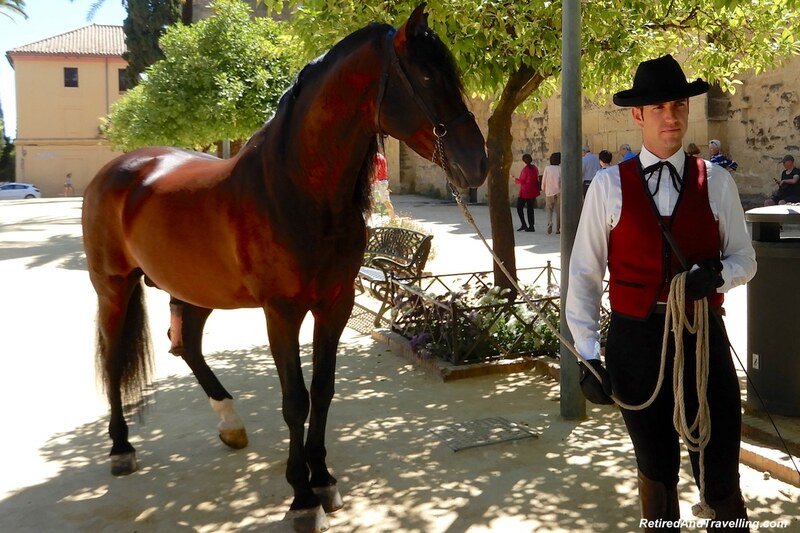 Did you see the horse show in Córdoba? What was your reaction to the series of performances? National Parks Trip in Canada and the U.S.